We are a recruitment company, predominantly taking on candidates who we can train as recruitment consultants, though we also recruit some other job profiles in things like legal and marketing. We hire about 70-80 graduates every year. It’s important for us to have a presence at Bournemouth University, a large institution on the South Coast, where we are also based. We are particularly impressed with candidates that come to us from Bournemouth University because they are work ready – many of them have done a placement year as part of their studies and have therefore already had a year working in industry. 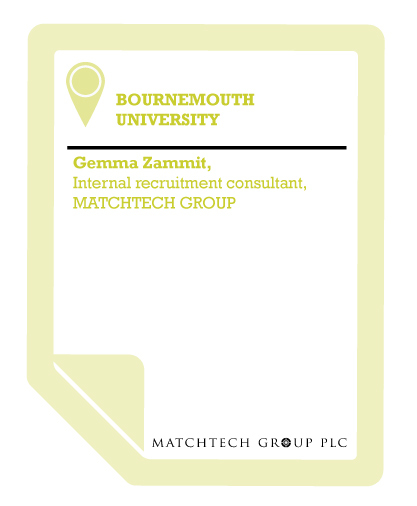 Matchtech Group have been working with Bournemouth University for a number of years but we are continuing to build our relationship with them and do more, no longer just attending careers fairs and delivering presentations but working with faculties and even individual professors to engage with students and make sure Bournemouth sends their best talent our way. The University careers team are great. They know exactly who we are, they’re friendly and always make time for us. If we’re ever on campus they’re very accommodating, always looking for feedback and taking the time to catch up. The University doesn’t do it all. We have to put in the effort and that is partly why we have begun to engage with specific faculties, to get better engagement. But the extra effort has paid off and we are recruiting more graduates who can really hit the ground running. One candidate came to us before he graduated. He studied business but had no idea what he wanted to do when he left university. Two years on and he is still with us, he’s been promoted to team leader, and is our brand ambassador for Bournemouth University, continually popping back to talk to existing students. Given this success we are continuing to widen our engagement, and are looking at running internships, offering work experience, placements and employing first year students to promote us as a company on campus. In recent years I’ve been surprised by how switched on and proactive first and second year students have become, thinking early on about doing a work placement and where they’re going to go when they finish their degree. We have quite a tough interview process but have been impressed by the calibre of candidates who are entrepreneurial, driven and want to do well. Going forward, we’ve upped the amount of work we’re doing with Bournemouth University to raise the company’s profile and this has benefited us in seeing candidates a lot earlier. When I first started, the majority of our applicants came from those who had already graduated but we’re now seeing candidates coming to us in their first or second years so we can identify good talent early on.